Smoking shrimp can be a little challenging because there is little fat content to keep the meat moist during the low and slow smoking time. Wrapping bacon around the shrimp solves this problem by adding a high fat content meat around the shrimp to protect it and keep it from drying out. This bacon wrapped smoked shrimp recipe is a great appetizer or side dish item that can be paired with any smoked recipe and can easily be added to your smoker at the tail end of smoking a large cut of meat. This is a convenient smoking recipe because it only takes about 35 minutes to cook on the smoker. 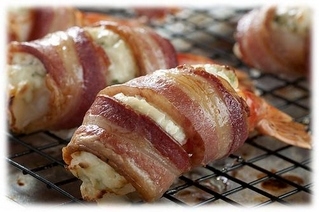 Are you ready to taste a little piece of heaven wrapped in smoked bacon? Light your charcoal smoker approximately 30 minutes, or 10 minutes before with a gas grill, before you want to start cooking. Wrap your wood chips in an aluminum foil pouch or a metal smoker box. Punch holes in the foil pouch to let the smoke escape out the top. Lay all your shrimp pieces out on a flat surface and season both sides with paprika, cayenne pepper, black pepper, and salt. Combine your cream cheese and crab meat into a mixture and spoon a small amount on top of each shrimp. Cut each slice of bacon in half and drop them in a large skillet to cook over medium heat. You want to cook your bacon about half way on both sides so it is just lightly browned and some of the fat can be extracted. Take your bacon out of the skillet and place on a bed of paper towels to soak up some of the excess fat. Take your half cooked bacon and wrap 1 slice around each piece of seasoned shrimp. Stick a toothpick through the bacon into the shrimp to help keep the bacon wrapped tightly around the shrimp. Place your bacon wrapped shrimp on the grates of your smoker and the wood chip foil pouch directly on your charcoal or inside your metal smoker box. Smoke the shrimp for about 35 minutes or until your bacon is cooked to the doneness you prefer. Smoked shrimp recipes have perhaps the shortest cooking times out of our entire list of fish recipes. This particular recipe could take longer because of the added bacon but it is important to precook the bacon about half way done and then lightly smoke the bacon and shrimp together. This will ensure your bacon and shrimp are done at the same time. Many people eat shrimp raw so you are really just leaving the shrimp on the smoker or grill long enough to flavor the meat and finish the bacon.